Bringing a group of artists together can be like herding cats: with the natural desire for personal creativity, artists and their work are inclined to go their individual way rather than function as part of a group. So, when universities across the country curate faculty exhibitions every year, one doesn’t expect to find a unified exhibition, but rather a miscellany of individual styles and themes displaying the variety of approaches informing an individual art program. This year, 42 members of the UVU faculty showcase their work at the Woodbury Art Museum, displaying everything from painting and ceramics to new media, with thematic explorations that range from the political to the functional to the purely aesthetic. If there is any unifying theme or gravitational pull in this exhibit, it is a focus on the political and social issues of our time. For instance, husband and wife Reid and Lindsey Elem both have contributed photographic work that explores environmental issues. Lindsey Elem’s “Holden” is photography masquerading as quilting handiwork with pictures of different textures creating squares, coming together to make a familiar six-pointed star pattern with a richly textured border. 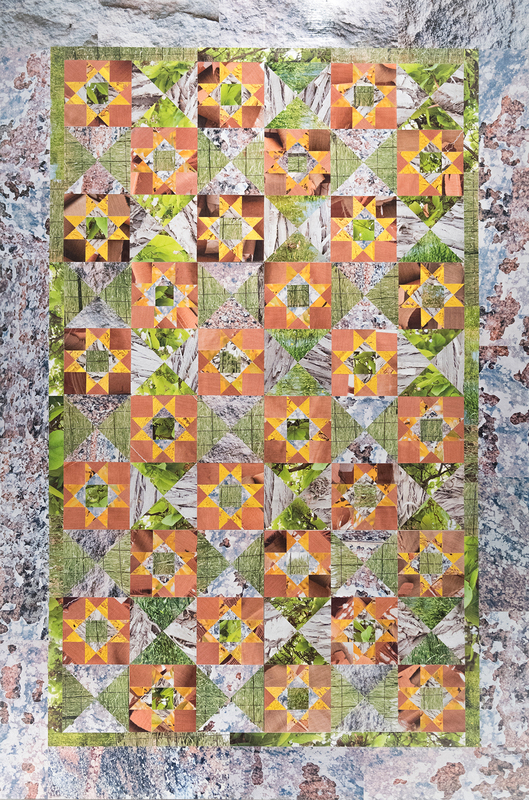 Interesting to consider is the female-dominated sphere of quilting and most textile works and how, by using nature photography, Elem is furthering and countering this view. By using natural textures, Elem highlights another area traditionally associated with women – the land. From an eco-feminist perspective, her photography suggests that just as women manipulated cloth and needle, they also have plowed the land, sowing rather than sewing, creating food for their families and communities. Meanwhile, Reid Elem has contributed several eco-photographs highlighting Utah environmental problems including the dreaded air quality. In his photograph “Inversion,” he shoots from the mountains, showing the smog layer separating him from the valley: the Spencer W. Kimball Building on the BYU campus is barely distinguishable, a heavy layer of dirty air settling above it. His photographs show a different side to living in Utah, highlighting relevant environmental and resource concerns which are easily ignored in day-to-day life. 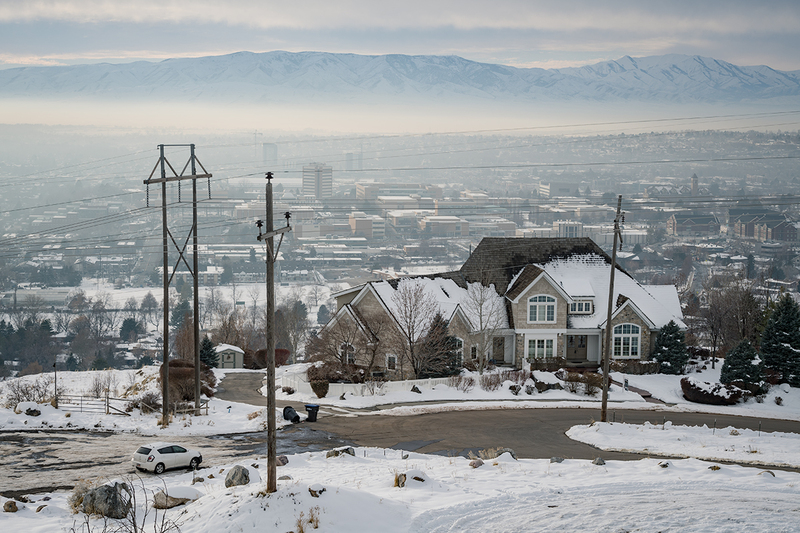 His photography is open, honest, showing both the beauty of Utah Valley and the clear sky above, as well as the thick, seemingly impenetrable in-between whiteness of the inversion. Other artists also target political and social issues. Howard Fulmer’s “America’s Pastime” creates a baseball using over 7,500 bullet casings in various stages of tarnish, suggesting that the true American pastime is not really munching on peanuts and Cracker Jack, but shooting. One need only consider the recent mass shooting in Las Vegas to realize our country is obsessed with guns — obsessed with having them, not having them, whether they are too accessible or not accessible enough. 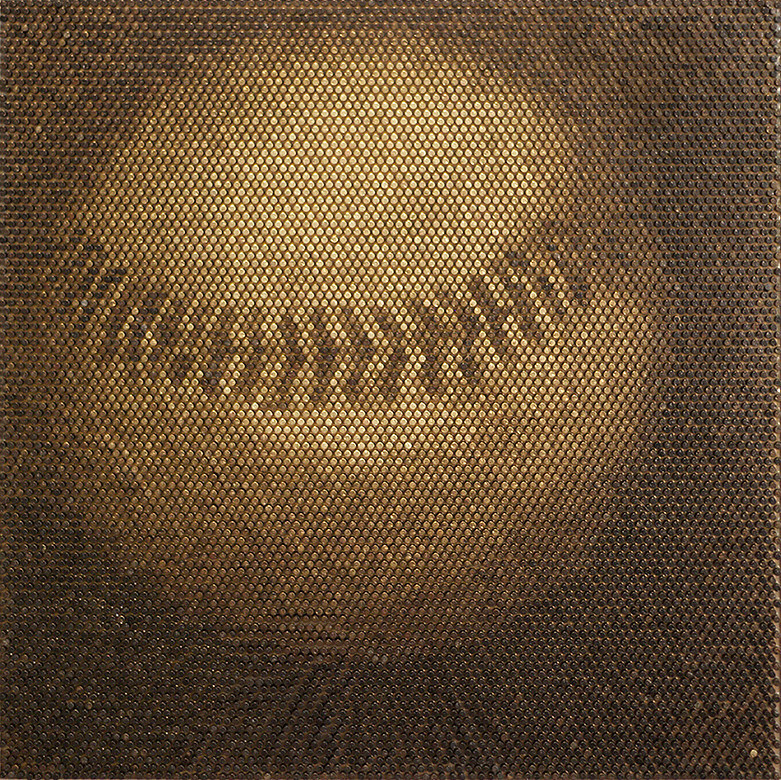 In Fulmer’s work, the bullet casings are tarnished, decaying, so the image of the baseball is tarnished, too. In all of our polarization about gun control, we are losing something in our Americaness, our unitedness. His question is poignant and difficult to answer: What do we do about guns? And, more importantly, what have we lost by fighting over gun control? Brandon Truscott’s digital illustrations also highlight an issue in contemporary American society—education. 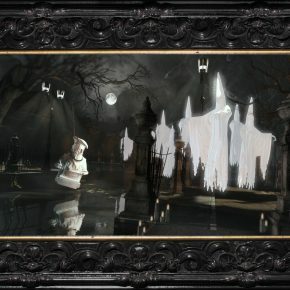 In his “Lynching Gutenberg,” white ghosts with tall pointed hats prepare to murder a bust of Gutenberg, inventor of the printing press. While we acclaim the Renaissance inventor today, his invention was not so well-received in his own time: the printing press facilitated distributing the Bible in the vernacular languages of Europe, a thought that had horrified the Catholic Church for centuries. Likewise, there is an educational/opportunity crisis in the world where a small number of people in the world receive full access to education while the majority do not share the same resource. These issues are exacerbated by the efforts of groups like the KKK — suggested by the pointed hats, which have their roots in Catholic Spain — who attempt to stop individuals from receiving opportunities. Truscott’s piece shows that this fear has existed for at least 600 years, and will likely continue into the future. The only way to combat the problem is to become aware of it and actively attempt to stop it. Some of the most striking pieces in the exhibit are the incredible ceramics of Brian Jensen, striking not for a political statement but for their exquisite aesthetic qualities. They are all vases with incredibly round, wide bodies and thin necks. All are covered with a beautiful crystalline glaze, in different colors, the most beautiful being a deep purple and blue. Crystallization in reduction is still a fairly new technique for pottery, really taking hold in the professional world last year. It is a very involved glazing practice, very precise in application and temperature, and requires more attention than some other glazing techniques. Jensen seems to have nearly mastered this form and the finished products are stunning. 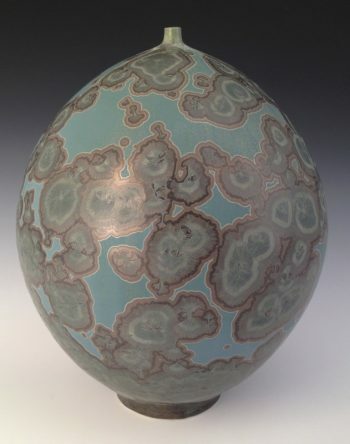 When completed and fired, the glaze looks like an intricate design of galaxies, salt crystals, or even formations of microscopic bacteria. The form of his vases with their wide bodies and small, straw-like necks are organic and interesting, complementing the circular patterns created by the crystalline forms. The rounded shape gives a feeling of looking through a microscope or telescope, discovering an unforeseen world that cannot be understood without explanation. In parts the vases seem to be breaking apart, the glaze cracking slightly around the crystals, but this only adds to the ephemerality and natural beauty of these vases. Jason Millward’s artworks are also beautiful with curving lines and smooth, perfected marble. His sculpture “Queen” is reminiscent of Matisse’s minimalistic female drawings, breaking down the form into only a few, large shapes. Unlike Matisse’s work, the “Queen” is clothed, elegant, smoothed and faceless, the focus not on her body but the flowing lines of her hair and dress. All of Millward’s sculpture featured in the show creates a sense of movement. His “Raven” flies though it is stationary; it is living though it is stone. Two pieces of marble flow beside a central piece in the forms of wings, the raven having tucked them in during a dive or as it rides the currents of the wind. 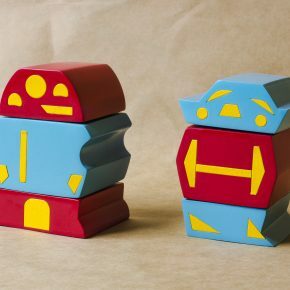 For functional sculpture, the exhibition includes Benjamin Evjen’s Allay Series, a set of toys/tools created for children who have epileptic parents. The toys include timers which are activated by the child turning the head of the toy, which starts the timer and allows the children to have a visual gauge for how long the parents’ seizure should last. Evjen, a graphic design instructor, includes a screen which shows exactly how the toy looks in motion and what a child could expect while holding it and using it. Also from the graphic design faculty is Gareth Fry who, using a series of images found in Google searches on religion and faith, creates visually interesting compositions. His work explores the misunderstandings that permeate our lives as well as offering a suggestion for how to overcome misunderstandings – listen. Related to this piece is a work by Nancy Steele-Makasci, who has several black-and-white block prints of figures and words on exhibit. 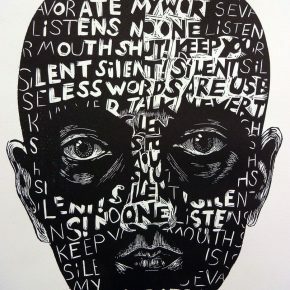 Her “Silent” depicts a hairless face filled with words associated with telling others to be quiet. The harsh, contrasting color scheme and the rough typography creates a harshness to the piece. It almost seems the face of a child, told to be silent for so long and so continuously, that they will no longer open their closed mouth to share their thoughts. Too many faculty works are on exhibit here to mention them all, but of note are some of the representational paintings, including beautifully executed, naturalistic oil paintings by Christopher Thornock, highlighting his ability to render emotion and texture in his paintings. Dallyn Zundel, Lance Peacock, and Perry Stewart also showed their representational abilities with their works, as if advertising the type of traditional painting and drawing education one can receive at the university. One painting with a photographic quality that caught my attention was Christopher Young’s “Lemons and Lord Leighton,” which is reminiscent of a Dutch vanitas painting. The lemons are a bright, delicious yellow, but they are also ephemeral and will spoil, as will the beauty of the young girl in the copy of Lord Frederic Leighton’s painting, “Pavonia.” An extremely well-known painting by the 19th-century artist currently valued by Christie’s for over 1.5 million GBP, “Pavonia” was named for a Dutch settlement. The Latinized translation of “pauw” translates to “peacock,” which explains the halo of peacock feathers behind the woman’s head. The feathers further highlight the ephemerality of Young’s piece, for they have already fallen from a living thing just as we eventually will fall into death. Though there is not a specific unifying theme or overall idea to this show, it is a wonderful selection of current projects by the UVU staff. From graphite portraits to musical pieces, there is a broad range of art that can appeal to any viewer, from the dedicated appreciators of realism to those who prefer conceptual, new genre pieces. Among these interesting and thought-provoking pieces are a few faculty members who seem to be circling the same themes, commenting on our current political climate, environmentalism, and specific concerns to the Provo/Orem area, inspiring viewers to look for ways to effect real change. Faculty Show 2017, UVU Woodbury Art Museum, Orem, through Dec. 9.